Mikhail Osipovich Mikeshin was born in the village of Maksimkovo Roslavl district in Smolensk province in February 9 (21), 1835. At the expense of the local landowner A.A. Vonlyarlyarsky, Mikeshin was sent to study at the Academy of Fine Arts, he graduated it with a golden medal in 1858 in the row painting class. In 1859, during the competition of monument designing, dedicated to the Russia’s 1000th anniversary, the best of the 50 projects of native and foreign sculptors was found the project, made by M.O. Mikeshin and I.N. Shreder. In the September 8, 1862 at the Sofia square in Novgorod over a large crowd of people, the monument was unveiled. It made authors famous in the whole country. After the monument was completed successfully, designing of monuments in Novgorod became the main activity for Mikeshin. 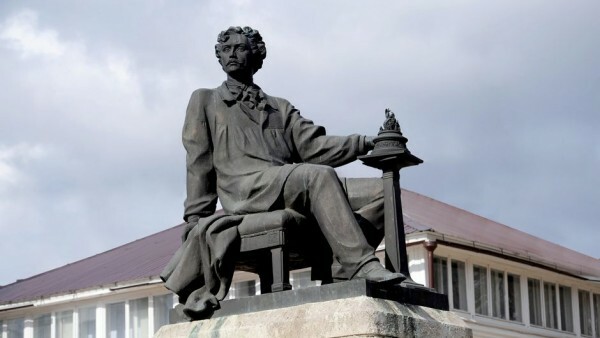 His best works, such as the monument to Kuzma Minin in Nizhny Novgorod, Ivan Susanin in Kostroma, the sculptured doors in the chapel of Prince Pozharsky in Suzdal, a monument to Admiral Greig in Nikolaev, Catherine II in St. Petersburg, Bogdan Khmelnitsky in Kiev, allowed him to take a prominent place in the history of Russian monumental sculpture. M.O. Mikeshin was the winner of international competitions: he designed a monument «The Portuguese constitution», set in Lisbon and the monument to Prince Mikhail Obrenovich in Belgrade. M.O. Mikeshin worked also in the Smolensk region in the Vonlyarlyarsky manor. From the park of the Vonlyarovo village to the Smolensk were taken two granite vases made by his drawings. M.O. Mikeshin is a graphic artist and painter, and author of interesting travel writings, a public figure and publisher. In 1870-1880 he edited the journal «Painter «, published one of the best illustrated magazines «Bee». Contemporaries called him «our Leonardo” due to his various talents and a large scale of his works. M.O. Mikeshin died in January 19 (31), 1896, was buried in St. Petersburg in the cemetery of the Alexander Nevsky Monastery. Monument M.O. Mikeshin established on the occasion of the 150th anniversary of the artist’s birth, unveiled in October 4, 1985. The monument is valuable as a historically accurate portrait of Russian artist, who was born in the Smolensk land. Authors — Moscow the sculptor A.I. Rukavishnikov, the architect I.N. Voskresensky. The monument was set on a small pocket area, which is organized to the left from the Tenishev street in front of the municipal budget cultural institution «The Center of Culture» and to the left from the regional state budget cultural institution «The Smolensk State Museum-Reserve». The Tenishev street is a busy highway leading to the Roslavl city, which is the native place of the artist. The monument is the monumental composition: a large bronze figure of a sitting artist and there is a model of the monument «The Millennium of Russia», located at the stack stand in front of him. The area under the pedestal of irregular shape, is made of wrought gray-pink granite, the area around it is paved with stone blocks. The M.O. Mikeshin monument is an object of cultural heritage.